Image courtesy of Jann Haworth, created by Nathan Florence and many others. Salt Lake City, UT- The Utah Museum of Contemporary Art (UMOCA), in partnership with The Leonardo, and the Brigham Young University Museum of Art present Work In Progress,a collaborative, traveling exhibit that celebrates women who are catalysts for change. Work in Progress begins a visual narrative citing women who stood alone, were inventive and dynamic, who tirelessly challenged prescriptive laws and rules, questioned the status quo, risked their safety to stand against prejudice and exclusion. "Few of us know this history," says project director Jann Haworth. "The film !W.A.R. (!Women Art Revolution) opens asking: can you name five women artists?" Haworth adds, "Work in Progress asks can you name five women scientists, mathematicians, activists, writers. The mural project arose out of a single frame in a comic strip that I created as part of a catalog for the 2009 retrospective exhibition of my work in the UK. In the strip, 'Mannequin Defectors' were marching past a street mural featuring the faces of women of distinction in the arts and sciences. To my shame I barely knew enough to cite 30 women. I was reminded of my knowledge gap when I saw !W.A.R. and it is this negative space that drives the purpose, form and style of the mural." The subject of Work in Progress is timely because by 2018 women will make up the majority of the of the country's workforce but still battle a persistent wage gap. Statistics reveal that gender equality, especially in pay, is the goal but not the reality, and given the current trajectory, won't be for another 118 years. 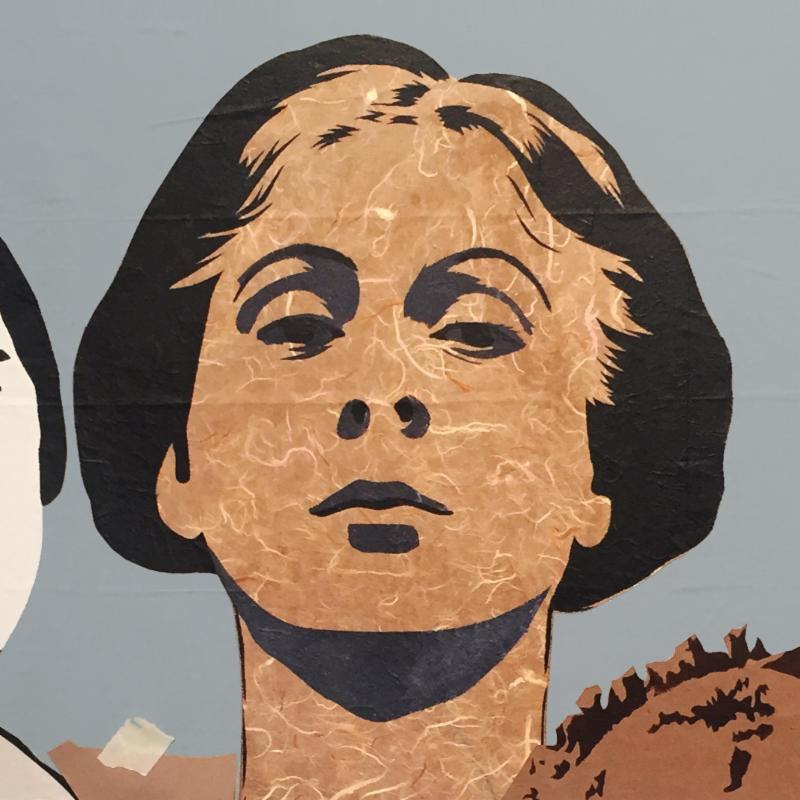 During the last three months, Haworth and fellow artist Liberty Blake have helped more than 60 people contribute to the twenty-foot-wide, 8-foot-tall collage. This community based method creation and expression encourages the project to grow as it travels from one community to the next, adding local character as it recognized the dynamic women in each community, compelling those involved (creator and viewer) to identify both how the contributions have impacted them personally, and to better articulate their own fundamental desire for progress. Along with the mural, portraits of the participants by acclaimed photographer Lynn Blodgett will recognize those in the community that are active participants in the strive for equality. Work In Progress open to the public on October 7th in UMOCA's Street Gallery with an opening reception on October 21st from 7-9 pm. UMOCA will also present a series of talks, films and a story telling night hosted by The Bee that expound on women's topics in the areas of art, gender equality, and progress. Visit our website for details: utahmoca.org. The Utah Museum of Contemporary Art will host the opening reception on October 21, 7 - 9 pm. The exhibition runs through January 14th with various public workshops and photo sessions occurring at The Leonardo. Future appearances at The Leonardo and the Brigham Young University Museum of Art.